The deadline for applying is 16th June 2018. 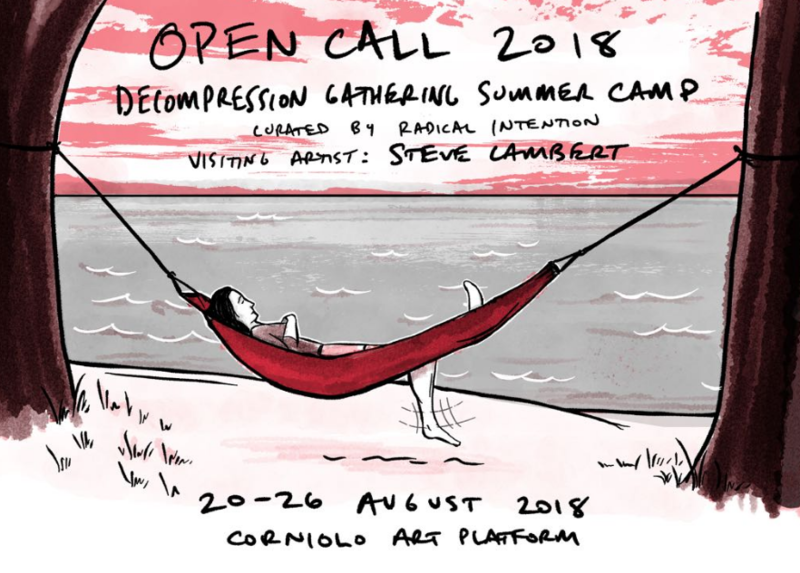 Invited by Radical Intention, Visiting artist Steve Lambert will be hosting the 2018 Decompression Gathering Summer and he takes decompression seriously. The field of Artistic Activism is rife with overcommitment and hard work is undervalued. There is a high risk of bitterness and burn out, for those who don’t quit entirely. To fight this tendency, the 2018 summer camp will structure fallow time (the irony of structuring fallow time isn’t lost on us), create boundaries to free participants from continual internet connection, and encourage leisure, wandering, and exploration – metaphorical and otherwise. During the week the group will have the chance to discuss projects and life in a relaxed atmosphere, create new relationships that might evolve, and explore the territory of the Mugello Valley. Participants are encouraged to gather for daily meals and will have time to share their past research. From there, they will have the opportunity to gather at their leisure, and share what they learn together at the evening meals on the days that follow. The group will investigate folk culture in the area surrounding Corniolo art platform through thematic field trips to enchanted Castles, Giotto’s residence or walking tours through the woods in search of the spring of the Arno River. These educational experiences function as different tool, contribute to the overall conversation around decompression, while disrupting the schedule of fallow time. The 2018 DCAMP embraces the idea of decompression as form of investigation in to ways of working. In 1993 croatian artist Mladen Stilinovic wrote a manifesto of laziness, stating ‘ Laziness is the absence of movement and thought, just dumb time – total amnesia. It is also indifference, staring at nothing, non-activity, impotence. It is sheer stupidity, a time of pain, futile concentration. Those virtues of laziness are important factors in art. Knowing about laziness is not enough, it must be practiced and perfected.’ (1993) With Irony, sarcasm, intelligence, stupidity and seriousness, the group of DCAMP 2018 will ask themselves how practice and perfect decompression. Steve Lambert has worked alongside artists and activists in 15 countries on 4 continents helping them to effect power. Trained in the arts, he is known for large scale, public projects that engage new audiences on difficult topics through the social science of comedy, games, theater, and democratic participation. Lambert is the co-founder and co-director of the Center for Artistic Activism, a research and training institute to help activists be more creative and artists to be more effective.As an artist, Lambert’s work has been shown both nationally and internationally, from art galleries to protest marches to Times Square, featured in four documentary films, and over two dozen books, and collected by museums and The Library of Congress. Lambert has presented at the United Nations several times. His research is included in a United Nations report on the impact of advertising on cultural rights and the basis of a book on popular understandings of capitalism. The workshop/residency will be held in English. The deadline for applying is 1st June 2018.
could influence the candidate’s practice. The registration fee is 400 euro. In order to secure your place, we will need a 100 euro deposit. The fee covers enrolment, accommodation (6 nights), and three meals a day. Travel expenses are not covered. On request, the organisation will provide candidates with invitation letters for external funding. (visiting artist fee, studio space, food and travels).